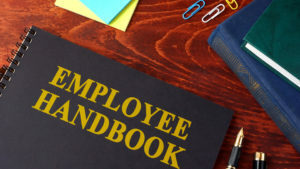 As your business grows and you begin to bring on employees, it may now be time to officially put your company policies in print with the creation of an employee handbook. The employee handbook isn’t just feel-good fluff that gives your new human resources director something to do. This document offers you big benefits by outlining your culture, rules, and the expectations you have for your employees. It can also serve as a protective shield if an unhappy employee or ex-employee wants to take you to court. Let’s look at what an employee handbook can do for your company, what should be included, and how you can make your employee handbook a living document that changes as your company and culture evolve. Let’s just take a moment to discuss that last bullet point. When you outline your policies for things such as employee conflicts, termination, non-compete, and, yes, even dress code, you clearly establish the rules. If an ex-employees seeks to sue for wrongful termination, you can hold up your employee handbook (and your ex-employee’s signed acknowledgement that they will abide by the handbook) to show exactly how the employee failed to follow the stated policies. In particular, a statement of “At-Will employment” in an employee handbook can offer strong employer protections. The introduction is your chance to welcome new employees into the company and to express the values, goals, and culture of your company. You may want to consider writing a short history of the company, describing your philosophy, and explaining the purpose of the handbook. Let your employees know that you are dedicated to providing an equal-opportunity, supportive, and safe workplace. This section allows you to articulate your zero tolerance for discrimination. This is also the place to include a commitment to fight against harassment and sexual harassment. Make sure that you fully understand federal, state, and local discrimination and harassment laws. Some state laws are more detailed than federal laws. This is a bit of a catch-all category that can include a lot of diverse policies. Here, you might want to include things like a non-compete and confidentiality clause. You may also spell out your privacy rules, drug testing procedures, and how employees are allowed to interact with social media. Take your time with this section and create policies to guide any behavior that might one day be problematic. For example, do you have a sales team? You probably want to write up a policy around gift giving and entertaining. (Take into consideration the gifting laws that pertain to your industries.) Write down a policy for how employees can use company vehicles and equipment. Finally, yes, this is where you’ll also want to put the employee dress code! Many small startups don’t feel the need for an attendance policy. As your company matures, however, employees will want to know what working hours are expected of them. This section can also contain information on telecommuting and schedule flexibility. Be sure to explain when employees can miss work and the penalties for absenteeism. You also need to respect federal, state, and local laws regarding meal and break periods. The Fair Labor Standards Act provides guidance on which employees may be salaried (overtime exempt) and which are paid hourly. In this section, you’ll want to describe how your company determines which employees and positions are salaried versus hourly. This is also the section where you describe how you define part time and full time positions. You’ll definitely want to work with a labor attorney in this area. If you misclassify an employee as over-time exempt, you could be highly vulnerable to a lawsuit. You also need to ensure that you meet state and local employee classification laws. Your employees are eventually going to want to go on vacation or take time off to welcome a new member of the family. You need to have policies in place for these normal life events, as well as unhappy surprises like a sickness or family emergency. Again, it’s important to understand what the law says. For example, you’ll need to comply with the Family and Medical Leave Act if you have 50 or more employees. Your employees are definitely going to be interested in all the benefits that you offer. This is the section to lay it all out, from 401(k) matching, to stock options, disability coverage, health insurance, and monthly massages. Okay, may the massages will have to wait until you increase your bottom line a little more! Employees deserve to understand the expectations you have for them and how their performance will be assessed. This section should include a detailed guide on how performance evaluations work. Sticking to the policies outlined in this section can help you avoid future liability for wrongful termination. Be as clear as possible when describing your disciplinary process. Let employees know what type of penalties to expect and what type of behavior will result in immediate termination. Include your grievance policy in this section as well as conflict resolution procedure if employees should have complaints against a boss or co-worker. Be aware, however, that by writing your policies down, they will be binding. If you fail to follow all the steps of a disciplinary policy described in your employee handbook, you may be legally vulnerable for wrongful termination. Definitely work with a labor attorney on this section. After all the work it takes to create an employee handbook, wouldn’t it be great to set it and forget it? Not so fast. Your company is a living thing that will continue to change and grow over time. Maybe you’ll introduce new products or even pivot into a new industry. Perhaps you’ll open up satellite offices in different states or even in different countries. As your business evolves, your employee handbook needs to change as well. For example, in five years, you might be able to offer great new benefits to your employees that you can’t today. The government or your local state may pass new laws that require you to update your policies. Perhaps a certain policy needed to be tweaked or you want to try a bold new experiment, like offering unlimited vacation time. For all these reasons and more, we encourage you to schedule a time each year to review your employee handbook to ensure that it still speaks for the most current version of your company. You may also want to ask your human resources director and legal counsel to give the handbook a yearly review as well! Need help creating your employee handbook? The Society for Human Resource Management offers an excellent template that can get you started, while the National Federation of Independent Business provides this step-by-step guide. If you would like professional help to create a personalized employee handbook designed for your business, Arch Resources Group can help!